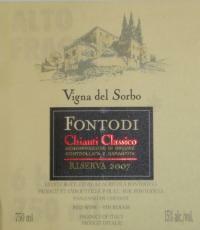 2009 Fontodi Chianti Classico Riserva Vigna del Sorbo - $69.99: Vins Rare, The finest selection of rare wines. The 2009 Chianti Classico Riserva Vigna del Sorbo is impressive. The overtness of the year is nicely balanced by the inherent freshness and acidity of Sangiovese. Hints of tobacco, cedar, licorice and spices are layered into the insistent finish. This is a terrific showing. I very much like the energy, length and focus of the fruit. I canâ€™t wait to see how this develops over the coming years. The Vigna del Sorbo is a bit overlooked in the Fontodi stable, but it is often striking, especially after a few years in bottle. This historic vineyard is planted to 90% Sangiovese and 10% Cabernet Sauvignon. The Sorbo has an element of freshness that the Flaccianello doesnâ€™t have. I will not be surprised if over time it enjoys a more gradual and finessed evolution in bottle. Anticipated maturity: 2017-2027.